Standardized alloys are usually used to manufacture ingots castings. 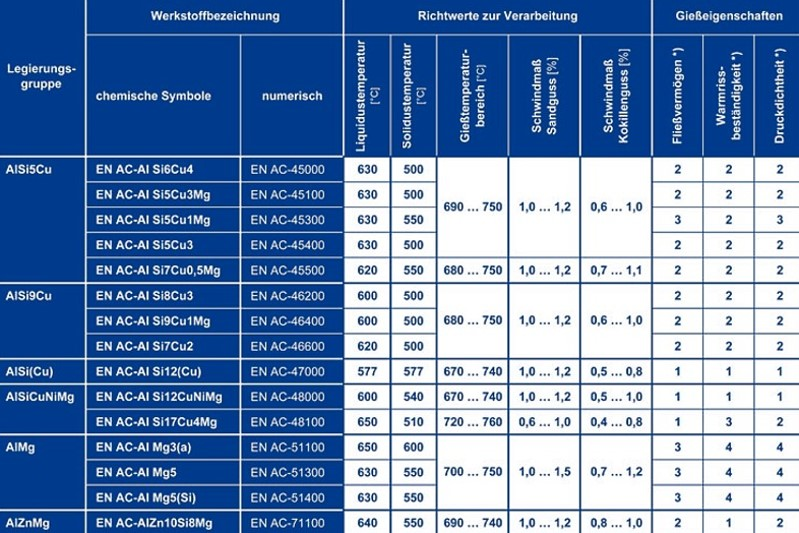 For ingot castings made from aluminum alloys, EN 1706:1998 describes the chemical composition and the mechanical properties and gives informative pointers on the casting characteristics of the alloys (for ingot metal, i.e. 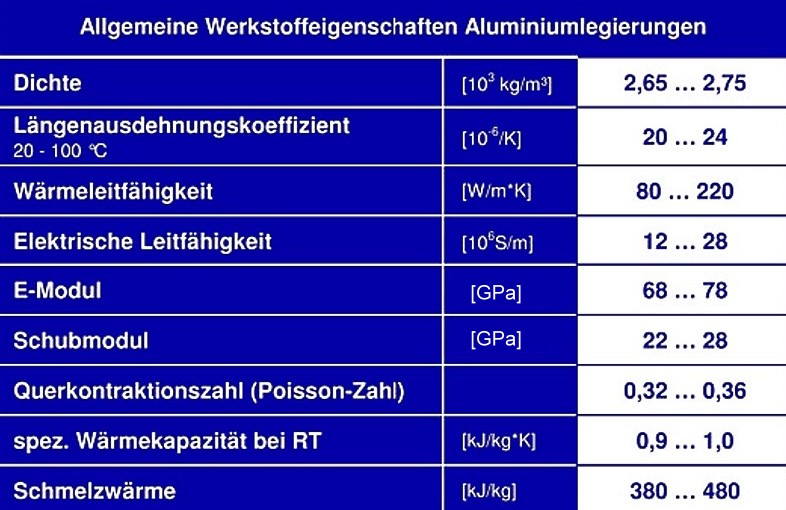 alloyed aluminum in pig iron, EN 1676 applies). sometimes have a wide range and certain elements can have a large effect on the casting characteristics and the mechanical properties, it is recommended that these are adjusted on a case-by-case basis and reduced if necessary in order to guarantee uniform casting quality. Each application case requires the right selection of materials and knowledge of the material properties. Aluminumingotcasting materials fulfill many requirements but can not always cover the entire profile of properties. The selection of materials must therefore be done carefully and an appropriate and suitable allow should be chosen under consideration of its suitability. However, in addition to the physical and mechanical properties, the casting properties in particular also have a significant effect on the attainment of the desired mechanical characteristic values. The decision on a casting alloy and on a particular material condition for a component should therefore always be agreed between the constructer and the foundryman. 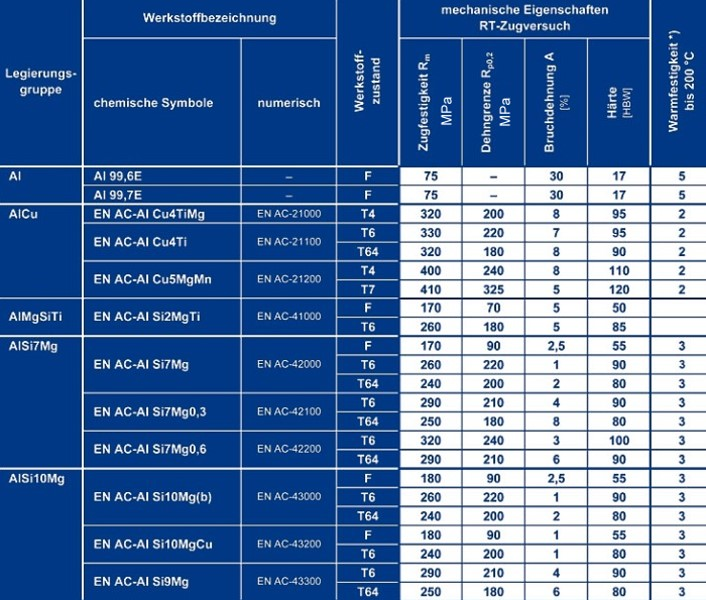 There is a general overview of the material properties (physical and mechanical characteristic values) of aluminum ingot casting alloys in table 1. 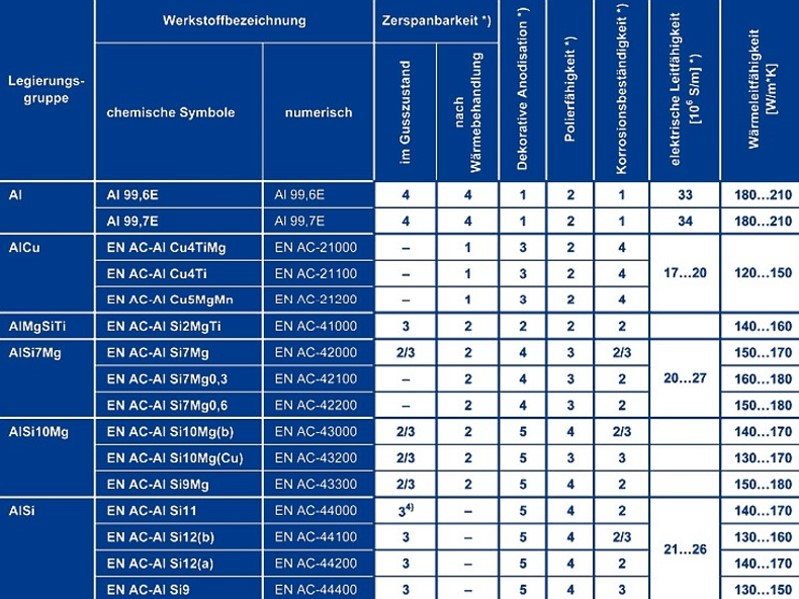 The values given in the standard apply for test rods which are cast separately. If test rods are taken from the casting, the dimensions, the position in the casting, the testing frequency and the values which are to be attained must be agreed separately between the manufacturer and the supplier. The values from the casting may deviate from the standard values due to changes in structure which occur due to different cross section thicknesses and accuracy. 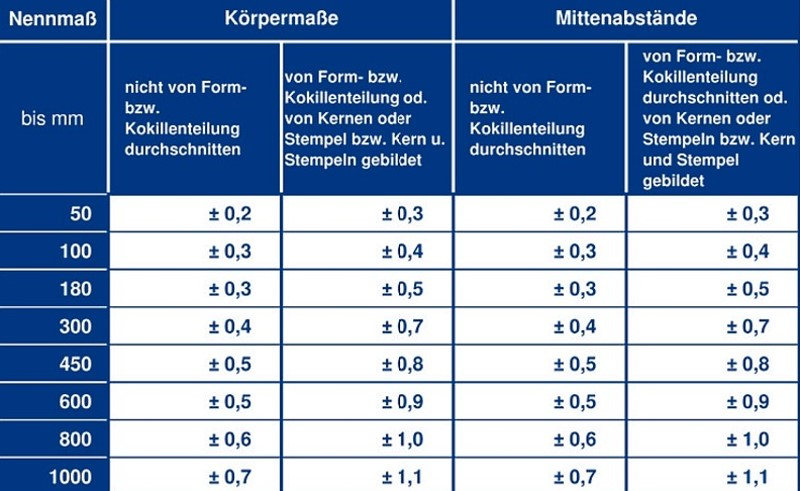 In this case, the specifications of the minimum values which must be adhered to and for the taking of test rods according to Table 2 apply. 1) The test rods must be cast at the same time and from the same molding as the castings. 2) The test rods must be cast in metal molds. 3) The test rods must receive the same heat treatment. 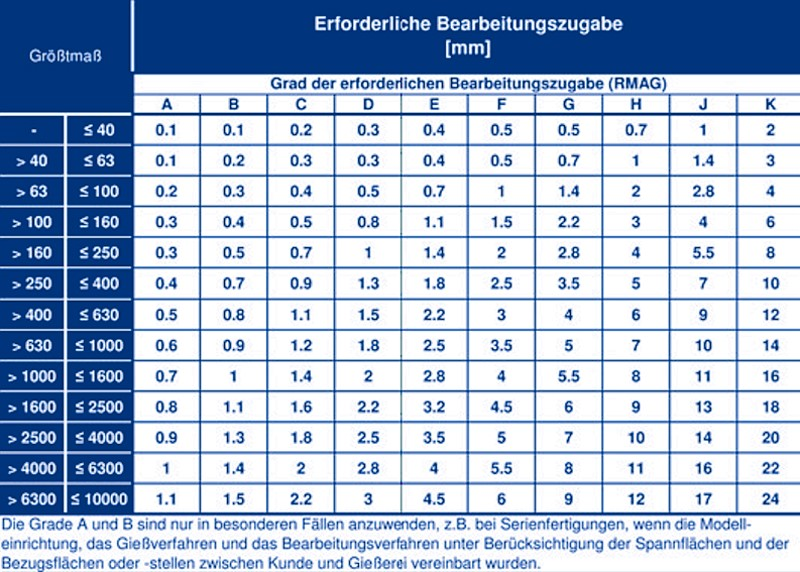 4) The diameter of the cast test rods must measure at least 12.0mm. 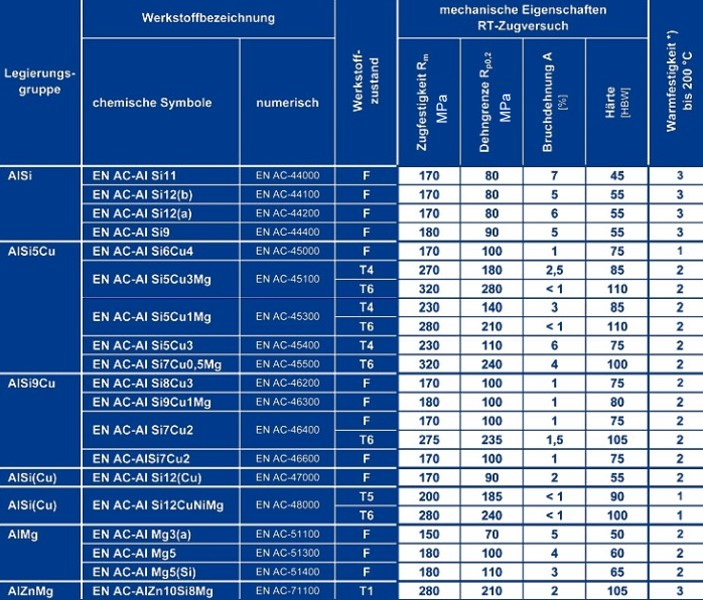 5) The gauge length and the gauge length of the test pieces must correspond to EN 10002-1 (EN ISO 6892). The test rods can be tested in their processed or unprocessed state. 1) outstanding; 2) good; 3) acceptable; 4) inadequate; 5) not recommended. Table 9 below contains informative information about casting weights, measurements and minimum casting quantities for the various molding and casting processes. In individual cases, a divergence upwards or downwards can certainly be possible and sensible. In general, the machining allowance is 1.5 to 3mm for sand casting and 0.7 to 1.5mm for gravity die casting. A higher allowance may be necessary and sensible for larger areas. 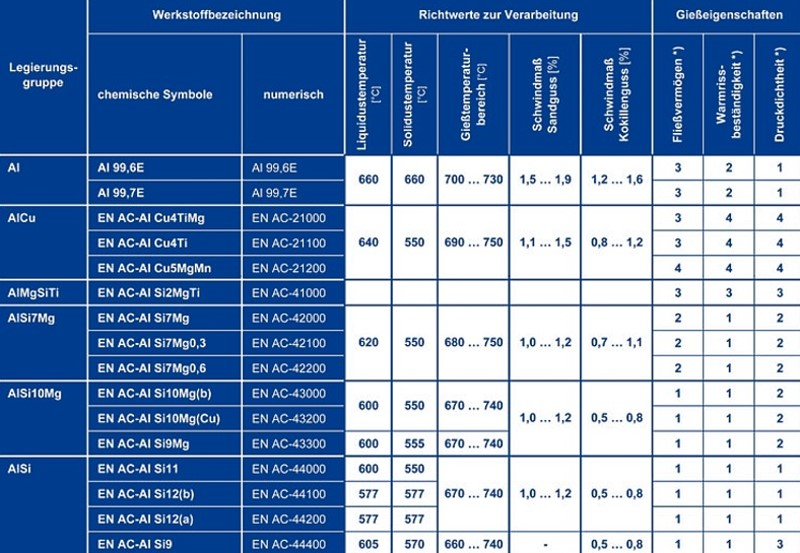 DIN 1680 and DIN EN ISO 8062 give general information about machining allowances. 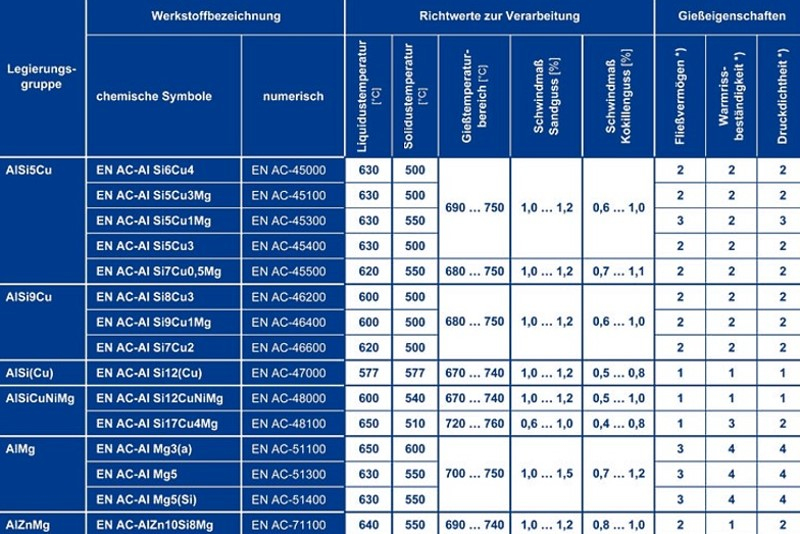 Table 10 contains the machining allowances for sand and gravity die casting according to DIN EN ISO 8062, whereby the required machining allowances which are typical for gravity die casting are provided for raw castings (RMAG) from grade D to F. For accuracies which can be achieved, there are set specifications from the Verein Deutscher Gießereifachleute (VDG, Association of German Casting Professionals), see Table 11 for aluminum gravity die casting.